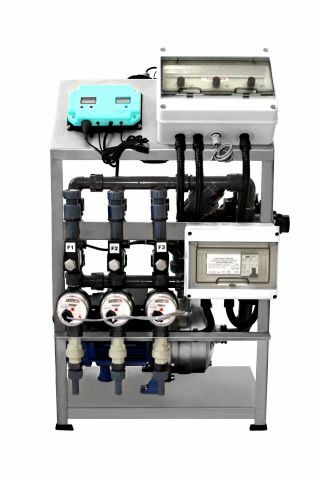 DosaBox is an automatic fertigation unit, representing a valid and economic solution for small and medium sized farms starting fertigation for the first time. Typical application fields are: orchards, citrus plantations, vineyards, vegetable crops both in open filed or in greenhouses, nurseries and pots. This fertigation unit has manual operation but it can be easilly automated for quantitative or proportional nutrients injection. The dosage of fertilisers is regulated by simple fertilisation templates which can be set according to the agronomic and nutritional requirements of crops, offering very good results with less effort. The DosaBox delivers 3 fertilizers in both quantitative or proportional mode. The systems displays also pH and conductivity values, thus allowing to monitor and adjust irrigation water. Proportional fertigation with pulse meter, applies fertlizers or chemicals from 0,1 to 1 % of water flow rate.